What technologies does the athlete expect? Moderator: Now we will start the panel session. The participants are Dr. Kashino, Senior Distinguished Researcher, NTT Communication Science Laboratories, who gave the previous presentation; Dr. Koji Murofushi, Sports Chief (and Sports Director), Tokyo Organising Committee of the Olympic and Paralympic Games; and Ms. Kuniko Obinata, Vice Chairman, Japan Paralympic Association and Member, Industrial Structure Council’s 2020 Future Development Group. 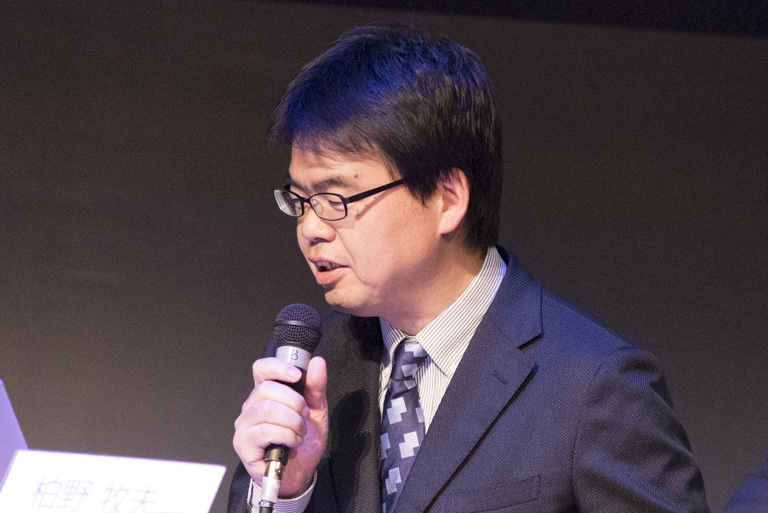 Professor Masahiko Inami of the University of Tokyo Research Center for Advanced Science and Technology will serve as moderator. Please proceed. 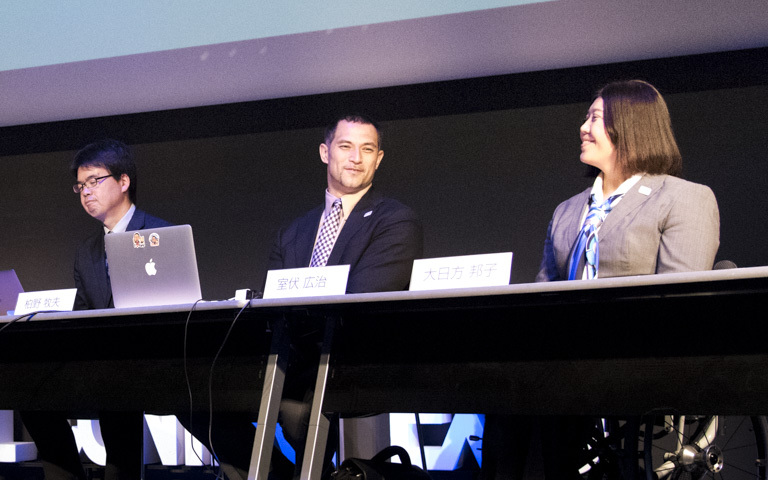 Inami: In the second half of today’s session, we welcome Ms. Obinata and Dr. Murofushi, who have been active around the world, and discuss the possibilities of sports and content technology. First, from the perspective of athletes, Ms. Obinata and Dr. Murofushi, please tell us your expectations for science and technology. Obinata: Before answering this question, let me first speak a bit about my background. I competed 5 times in the winter Paralympics as a chair skier who alpine skis in a seated position. Para Alpine skiing is a sport that involves balancing, using a ski attached to a chair. There are competitions such as downhill, which involves skiing down a mountain slope course, and the slalom, which involves skiing while knocking down poles. In some cases, we go at high speeds of 100-130 km/h down the slope. Speaking from my experience of being a Paralympic athlete for about 20 years, there are plenty of things to expect science and technology to contribute to sports. And from the standpoint of both researchers and athletes, I feel that there are many areas that should be thoroughly investigated. Particularly in the case of skiing, since it is a competition that uses tools, it is possible to clarify how humans experience and use the tools, and to make them easier to use. In particular, each country has worked hard to develop ski chairs. Since you can’t use your knees in chair skiing, you use a spring between the chair and the ski instead, and give it various settings to make the spring act like a human knee. Although it mechanically controls the strength of the spring and the speed of expansion and contraction, I think that there is still a gap between the feeling of the athlete and the movement of the machine. As technology evolves, I think that if we can develop tools that are more integrated with athletes’ movements, both the competitors and the spectators will enjoy it even more. Murofushi: It is precisely the evolution of technology that people abroad highly anticipate for Tokyo 2020. We are currently working on making this the most innovative Olympics. In this way, I am very much looking forward to the progress of myself, science, and technology. Dr. Inami was talking about adopting advanced technology to watch sports and enhance its appeal. This point will be partially adopted soon and I am very much looking forward to it. Still, as Dr. Kashino discussed, the attempt to use knowledge of brain science to improve the performance of the athlete has just begun, and I think there isn’t much of a precedent. I think that it is a very challenging effort, but by inserting a scalpel into the unconscious reflection of implicit brain function and utilizing knowledge gained from doing so, it is possible to raise the quality of competition. I expect this to be very useful in scenarios where the competition hinges on 0.01 seconds. Especially important in improving competitive sports is seeing oneself objectively. It is essential to observe your own strengths and weaknesses objectively and further extend or improve them. Science will be of great help here. It is difficult, but I think it is a very important initiative. Inami: Just as you said, I believe that there will be great development in the field of sports by cutting into pieces areas where scientific approaches haven’t touched. For example, the progress of science and technology will be useful for the area that connects the internal view of what the athlete feels (subjectivity) and objectivity. With top athletes as research subjects, this can be clarified for the first time. 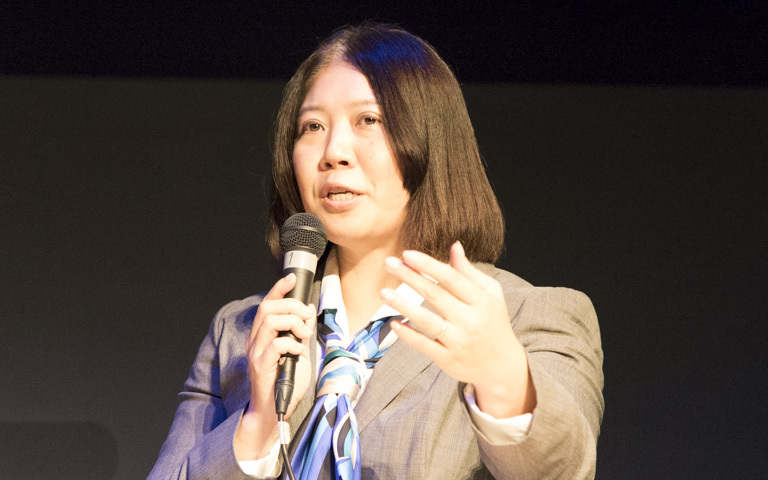 Inami: Next, I would like to ask Dr. Kashino -- in training and coaching, when conveying subjectivity or internal views by changing them into words, it seems that there are things that can’t be conveyed very well. Would it be possible to support communication through technology? Kashino: I think the gap between subjectivity and objectivity is the greatest problem that sports has. This is something that can’t easily be put into language, as you said. There are many things in expressing oneself or in communication between a player and a coach for which words themselves can’t be understood meaningfully. So, what is often done is to communicate through visual media, such as photos or videos, or even motion capture, to capture and extract the essence of movement. This video is a side-by-side comparison of my images using motion capture of former professional baseball players and amateurs pitching. While the difference is obvious, by only looking at these images, I don’t know the timing of power application or the strength. No matter how I try to imitate the form, I can’t know if they are applying pressure or not. Moreover, if I am too focused on form, this might actually interfere with movement. For example, if I see that the shoulder is rotating too early and try to change only the angle of my shoulder, it will only become cramped and I won’t throw well. Well before this, there is a real cause in the timing and force adjustment of a weight shift. When you listen and compare the differences in the sound of a professional and an amateur pitching, the professional is very crisp. The big difference is that professionals adeptly use the tilt of the mounds, completely relax partway through, and move efficiently. Likewise, even with a golf swing, professionals demonstrate their power adeptly at the moment of impact of a driving shot, whereas amateurs are constantly using unnecessary power. Although what I’ve described is just one approach, in short, it is thought that if we can extract only the important essence in sports and present it in a way that can be grasped intuitively, it will be useful for coaching and training support. Inami: Dr. Murofushi, I’ve heard that you have developed your own training methods in various ways, including efforts to convert motion into sound. Murofushi: After I finished university, while in graduate school, I worked on developing a training machine using a small sensor. For example, I was engaged in things like installing a small sensor on the hammer’s steel wire, acquiring dynamic data such as speed and force, and visualizing it. By continuing to collect and compare that data, I noticed that in March and May, the initial speed of releasing the hammer was about the same, but the pattern afterward was different. So I used this to objectively review my performance as to what was actually different. In addition, I was working using a sensor attached to the hammer to convert acceleration into sound and provide feedback. A hammer throw starts to accelerate when you reach your right foot, but in reality, your movement does not lead to acceleration, and sound provides feedback to confirm that. In this way, if you can present scientific data such as dynamics in an easy-to-understand format, and players and coaches can share data, I think that this can be of great use in training and coaching. Inami: By the way, can the movement of athletes besides you be converted to sound such that they can listen to it to use for their own training? 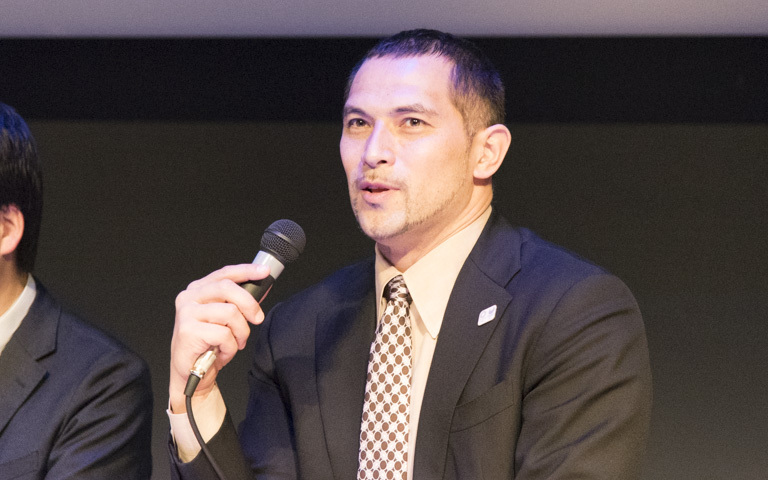 Murofushi: As Dr. Kashino mentioned earlier, I think that we can generally show the difference between the sound of a professional and an amateur, but to make use of it to improve athletes’ skills, I think it’s necessary for various types of top athletes to accumulate data. Of course, each person is different in terms of physique, power, and how they rotate, so you need to find a type that is similar to you and train in a way that suits you. Of course, it is also meaningful to communicate with words. On top of that, if there are even more useful tools, they should be of great help in the communication between players and coaches. Inami: Thank you very much. What do you think, Ms. Obinata? For example, Tokyo Institute of Technology’s Associate Professor Shoichi Hasegawa is developing a system for training that uses a pressure sensor on a ski and converts into sound changes in the center of gravity. When he experimented using these skis, he said that it already detects that you’re going to lose your balance from about two turns earlier, through deviations in the sound pattern. Obinata: That’s really interesting. Looking back on my active days, I also had a sense that I was losing my balance form about two turns before falling. My body’s movement was behind my ideal course, and I lost my balance trying to correct it, causing me to go off course or fall. As a coach, I’ve also realized that usually the cause of falling is not at the moment of falling, but rather one or two turns before. However, this is difficult to convey to beginners. Beginners are likely to look back on the moment that they fell. Considering this, if you watched a video of the images the player was looking at and watched the full set of movements in virtual reality, you might see that she wasn’t looking in the direction she should have been, that she has a strange habit, or that she has a different movement on the right and left. Even though I try to convey this in words, there are some things that can’t be conveyed well, so I think that it is good if we can cover this area with technology. Inami: Certainly, as far as things which have been used up to now, it was at most about capturing motion through video and watching it. But from now on, by clarifying how to use the trunk’s muscles or power through various sensors, and giving feedback through sound or virtual reality, ways of training may change greatly in the future. Kashino: Although visual feedback such as video is best if you are only capturing the shape of something that is still, if you want to capture the dynamic change of movement and power, it is better to incorporate another method such as sound. In particular, sound corresponds to the degree of power input -- if you hit a drum hard it is loud, and if you hit it softly it is quiet. You can therefore intuitively convey the rhythm of motion. I think it is better to combine various techniques at the appropriate time and place according to various types of training. Inami: Next, related to the advancement of technology, I would like to discuss fairness in sports, including technology doping problems. Murofushi: First, what is the difference between “play” and “sports”? To put it briefly, I think it is whether there are common rules or not. Creating rules for play makes sports. I think the main point is that even if I don’t understand the language, I can play sports with others if I only understand the rules. How to create those rules varies depending on the competition, and there is an element that changes considerably with the progress of technology. However, I think the basic principle of sports is to always play them with rules. Inami: Dr. Murofushi, you’re in the position of creating rules. What kind of points to you pay attention to? Murofushi: I think that it is essential to create rules that allow for more people to be accepted while considering the historical background and ethical issues. Inami: I see, it is to create rules that both players and audiences can accept. What do you think, Ms. Obinata? Obinata: Recently, there was a major debate because Paralympics long jump competitor Marcus Rehm (Germany) said that he wanted to participate in the Olympic Games. Holding more than a gold medal record in the Olympics, he couldn’t dispel concerns that his prosthetic foot gave him an advantage. Ultimately, he gave up on participating in the Rio Olympics. There is basic disagreement on whether using a prosthetic foot is advantageous or cheating. I also live with prosthetic limbs, but although I am able to walk with them, running and jumping are completely different and very difficult. I need technique, muscle, and balance ability to adeptly control the prostheses, and to jump, it is necessary to sharpen these sills. Considering this, one wonders whether Marcus Rehm’s record was thanks to the spring of his prosthetic foot or unfair because of it. To clarify this issue, I think the accumulation of data is indispensable. In other words, to make fair rules, we need the power of science and technology. I think that it is possible to improve the quality of sports competition by accumulating and analyzing data and creating fairer rules. Inami: In the Paralympic long jump, as a regulation, you cannot use a spring in the prosthesis. However, it is very difficult to define a spring. Human tendons are also springs, and a carbon prosthesis itself has springiness. In the first place, a substance without springiness is a completely rigid body, but such a substance doesn’t exist on earth. Then how do you grasp the definition of a spring? Furthermore, it’s not permitted to use tools that are superior to humans, but there is the question of to whom we are comparing. In the future, the more technology advances, it seems necessary to define such fine points and decide on the rules. What do you think about this, Dr. Kashino? Kashino: That’s a very difficult problem. If you use the same tools, you can compare techniques using those tools, but there are infinite disagrees of disability, and it is extremely challenging to figure out where to draw the line. Also, as I mentioned earlier, as it is possible to increase performance by giving stimuli to the sensory system and the brain itself, we must discuss how to handle this. In a sense, such attempts can be said to be doping. It will be necessary to deepen the discussion on how to deal with such gray-zone matters. Including such things, it seems there is nothing else but to build objective evidence and have discussions based on this evidence. Inami: Well, we’re almost out of time. 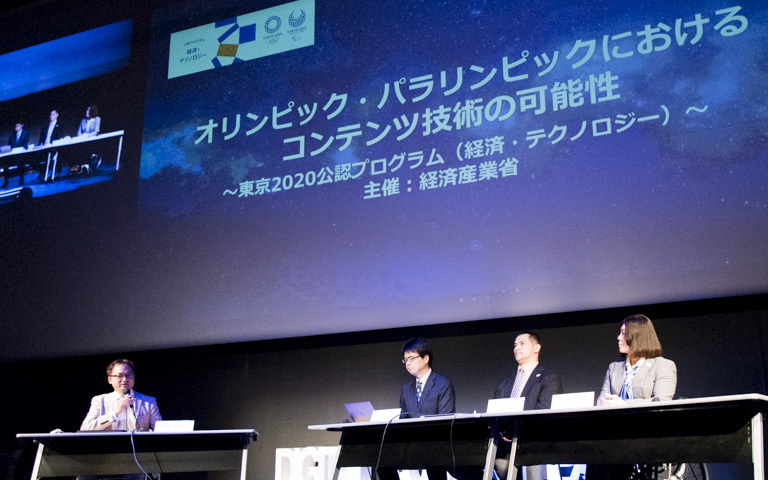 To wrap up, please tell us your expectations and thoughts for the 2020 Tokyo Olympic and Paralymic games, and what you would like to convey via the Olympic and Paralympic games to the young people who will lead the future. Murofushi: I feel that what we have to do in the future is sports presentation: convey the fun of each competition beforehand, make each competition and events between competitions exciting, and convey the situation during competition more realistically. I think that it’s important to communicate the fun of sports to the fullest. Since there are various competitions for the Olympic Games and the Paralympic Games, we need some ingenuity for even people watching for the first time to understand the rules and enjoy the competition. I think that advanced technology is very useful here. Obinata: What I want to tell young people from my experience as a Paralympic athlete is the real pleasure of doing what I thought I couldn’t do through sports. You can expand your possibilities. Of course, athletes make constant efforts, and with sports equipment and technology, new possibilities will grow. For example, in skiing, in the 1990s, a carving ski was developed for alpine skiing. Technology and speed have changed greatly since. Such progress will likely continue in the future. Likewise, I think that at the Paralympic Games, we will be able to do a variety of things with the emergence of new technologies. Of course, there must be the human ability to master it, but via the Games, I would like to tell even more people that big possibilities are expanding. If technologies can expand the possibilities of human beings even more, I think with that will come the ability to live even more positively. Kashino: Our research is to establish a scientific way to bring out the potential of human beings as well as of sports. The Olympics and Paralympics are one such opportunity. From the perspective of brain science, I hope to contribute to supporting sports, health, and longevity of people of all generations, from children to adults to the elderly. Inami: Thank you, everyone. I myself have run away from sports since I’m bad at them, but becoming involved with sports through research, I’ve realized that sports connect people in various fields and has the power to bring them together. I feel the greatest value of sports lies here. In this sense, we hope that the Tokyo Olympics will be an opportunity for more people to become interested in sports and to connect with various people. Thank you for your time today.